Herexquisite beauty and brilliant mind were not enough to free her from captivity.That took her skills with a knife, plus the power of a goddess. Shewas born in poverty, in a dusty village under the equatorial sun. She doesnot remember her mother, she does not remember her own name–her earliest clearmemory is of the day her father sold her to the tall pale man. In theCourt of the Pomegranate Tree, where she was taught the ways of acourtesan…and the skills of an assassin…she was named Emerald, the preciousjewel of the Undying Duke’s collection of beauties. She calls herselfGreen. The world she inhabits is one of politicalpower and magic, where Gods meddle in the affairs of mortals. At the center ofit is the immortal Duke’s city of Copper Downs, which controls all the trade onthe Storm Sea. Green has made many enemies, and some secret friends, andshe has become a very dangerous woman indeed. Acclaimed author Jay Lake has created aremarkable character in Green, and evokes a remarkable world in thisnovel. Green and her struggle to survive and find her own past will livein the reader’s mind a long time after the book is closed. Thanks to Tor for sending me a copy of this book to review. Green is one of those books that peopleeither love or hate. There isn’t much middle ground, here. After reading Green, it’s easy for me to see whypeople feel either way about this book. There is plenty here to love and plentyhere to dislike. It’s an interesting mix of elements which people tend to reactdifferently to. Theshining element of Green is JayLake’s stunningly eloquent prose. His writing style reminds me a bit ofJacequeline Carey’s, only less wordy. It’s flowing and lyrical and stunninglydescriptive. In fact, the prose fairly cause pages to turn on their own. It’seasy to read Green to enjoy Lake’sincredible writing if not for any other reason. 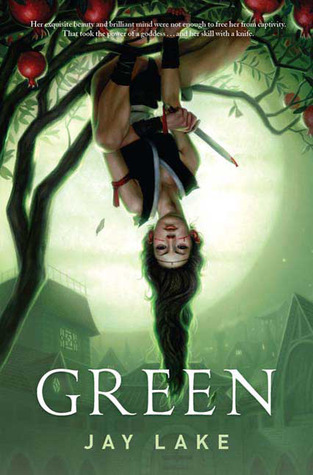 Despite its faults, Green is artistic due to the writingand, I should also mention, the beautiful cover art. Thefirst half of Green wraps itselfaround the reader as Lake introduces us to the young child, who later namesherself Green. Readers are taking on a captivating journey as her father sellsher and she is taken from her desert home to a far off land where she learnshow to read, write and become a lady. Later, she meets her Dancing Mistress andshe learns how to attack, defend and other skills of that nature. It’s afterthis point that Green falls apart.However, much of the first half of this book is so stunning and interestingthat, when the book falls apart, some readers might not mind it. Others mightfind the second half of the book so jarring that it leaves a sour taste behind. Green,herself, is an incredibly strong female protagonist. She is a woman who losther heritage, and through rigorous training becomes more culturally comfortablein the land which holds her captive. Furthermore, she undergoes an almostunbelievable training program and refuses the name given to her by the man whoruns her training program and instead names herself. In an impressive feat ofrebellion in her struggle for freedom, she even physically maims herself toruin her beauty so she wouldn’t be wanted for pleasure. Her struggles don’t endthere. On her journeys and further struggles Green seems to grow and evolve,constantly challenged and constantly finding an inner strength to overcomethese challenges. She is a strikingly deep character and incredibly memorable.Fans of strong female protagonists really should read this book, because Greenmight redefine the word, “strong” and she never once looses her depth. Green lost me after Green’s lastconfrontation with the Factor. While the prose remained stunning and hercharacterization remained solid and well done, the plot took twists and turnsthat weren’t the least bit believable, and a few didn’t even seem necessary. There were implausible plot twists andjourneys that seemed to go on and on with no real point. The book seems toloose its focus and Green seems to travel helter-skelter throughout the worldfor no real reason. Interesting things happen to her and she does learnnecessary lessons needed for the final events that take place, but much of thesecond half of Green read as filler, unnecessary, unbelievable events to fillpages rather than anything else. Dueto the strong first half of the book, this second half was a hugedisappointment. The other major problem I had with Green was the ending, which was unbelievable due to the fact thatso many implausible events had to come together to make Green the one person towhich the fate of the city hinged on, which seemed a far too convenient way to tie up loose ends. Despiteits problems, it’s easy for me to see why some readers absolutely love Green. Lake’s writing is absolutelystunning and Green herself is a fascinating well-wrought character withincredible depth. These two facts might serve to carry some readers through.However, for others, the unbelievable and endlessly dragging second half filledwith events that seemed more filler than anything else will leave readers witha sour impression. In the end, Greenleft me wishing Lake had focused more on the character Green rather than endlessjourneys and odd happenings in foreign lands punctuated by a poor ending.However, regardless of my feelings, this book is still a solid three star readwhich may appeal to some readers and not others. There are things in Green that are absolutely stunning,which are nicely balanced by other things which may cause a few eyes to roll. I completely agree with your review. I loved the first part of the book, but then the 2nd half lost focus. Sounds like it could be an interesting novel, even with its flaws. I'll have to keep an eye out for this one; your review made me want to give it a try. I've had my eye on this one for a while. The only Jay Lake I've read before is a short story in Tales of Dark Fantasy 2 – indeed, one featuring Green – and I adored it. This book has been singing me a siren song since, but now… now I'm not so sure. Wow sounds like a very interesting story and the review is good too. The cover of the book itself shows that this story is different from others. I will surely read this one very soon. Thanks for sharing the post. Thanks for this review. I've been thinking about reading this book, but it sounds like I would be one of those people who wouldn't like it because of the unbelievable plot twists. That's something that would bother me! I picked this one up from my local bookstore to browse through – and the blurb seemed pretty nice. However, now I got my doubts! Fantastic review by the way 🙂 Have actually given you a shoutout on my blog when I first started reading book blogs. Had sat and straight read through your entire blog posts back to back!